ArtSnacks [http://www.artsnacks.co/] is a monthly subscription service for the best art products around, providing artists all over with top-of-the-line art supplies. ArtSnacks is the creative brainchild of Lee and Sarah Rubenstein, a brother-and-sister team who are also behind EatSleepDraw, one of the largest user-submitted art sites on the internet. $25* a month with free shipping within the US (for those outside of the US, it’s unfortunately an additional $10 a month for shipping). They offer 1 month, 3 month, 6 month, and 12 month plans. With discounted pricing at the 6 and 12 months tiers. The cut-off date for each month’s box is the 23rd, if you subscribe after that you’ll receive the next month’s box. Mine has so far been arriving around the first week of the month, so thus shipping has been about a week from the cut-off date. ArtSnacks says that they will ship internationally to any country, but note that they cannot provide tracking information if shipped to any countries outside of those listed here. 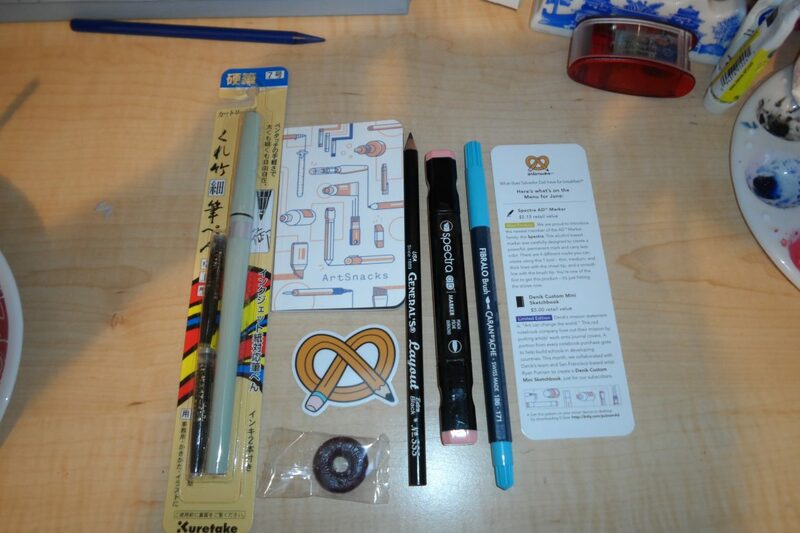 A simple small, white box with the ArtSnacks logo – a pencil in the shape of a pretzel – stamped on top of it. I personally love the logo, it definitely convey’s the brand in a fun way. Most of the items are wrapped all together in yellow-green tissue paper, held together with an ArtSnacks sticker that mentions their #ArtSnacksChallenge (more on that later, or click here to jump right to it). Every month, we deliver 4-5 full size premium art supplies right to your doorstep. Every order includes a “menu card” describing each product and how best to use it. There’s usually been a die-cut sticker with the ArtSnacks logo on it, the exception being in March, for their anniversary, where the sticker was swapped for a pin of the logo. There has also been a random piece of candy included in each box too. I enjoy the idea of the ArtSnacks Challenge and the fun bit of community it brings. I’ve only properly gotten it done with all materials twice. While, with all subscription boxes, there is always a little bit of a hit-or-miss with the items, I feel ArtSnacks works out the best with the randomness. I certainly wouldn’t have tried using some of the products on my own, but through ArtSnacks I’ve enjoyed trying out some different things and been made to try out different colors than I might pick out myself. Personally I have and still am really enjoying these boxes every month. They’ve definitely helped me to draw more and brought new inspiration & motivation for traditional art. The price point for a US resident is certainly not bad either and I believe is worth it on that end, although the additional $10 shipping for international subscribers feels like it’d be too much for me if I were considering it and were still living outside of the US. So for those international residents interested, it may be worth looking at previous box contents and seeing if it would be worth it with the exchange rate applied. Below is a quick overview of content Full posts with better more detailed review on each month’s boxes and their contents will be posted in the future as time permits. This was my first ArtSnacks box, and was quite nice. I loved the logo pin for their Birthday, which nicely coincided with my own Birthday also in March. The RENDR paper was unfortunately a bit bent from how it was in the box, it and the paint marker I haven’t used much yet. But the colored pencils I loved and definitely intend to buy more of and the KUM sharpener I quite like also. Favorite item this month was definitely the Faber-Castell pencil, very comfortable to hold. I enjoy the marker and brush pens, but only wish I could have a different color selection particularly with the Le Plume brush pen as the pale yellow color doesn’t stand out too well. The Kuretake water brush has been my absolute favorite and most used item from this month and overall, it’s something I’d been wanting and was so excited to see included. The KRINK marker unfortunately I can’t quite get a good handle of so it’s gone unused for me though. Kuretake brush pen has been great and quite enjoyable to use. It’s encouraged me to make more efforts with brush calligraphy too. The spectra AD was my second favorite item with it’s bright peach pink shade. Was very happy to see the Masters’ Brush Cleaner included, I’d seen it recommended highly online previously and had it on my wishlist for awhile. The QoR watercolor is my first paint from a good quality brand and I love it.